Cervical cancer mortality rates (European age-standardised (AS) rates ) are significantly higher than the UK average in Scotland, and similar to the UK average in all other UK constituent countries. For cervical cancer mortality differences between countries largely reflect differences in incidence. Data is for UK, 2016, ICD-10 C53. Cervical cancer mortality is related to age, with the highest mortality rates being in older women. 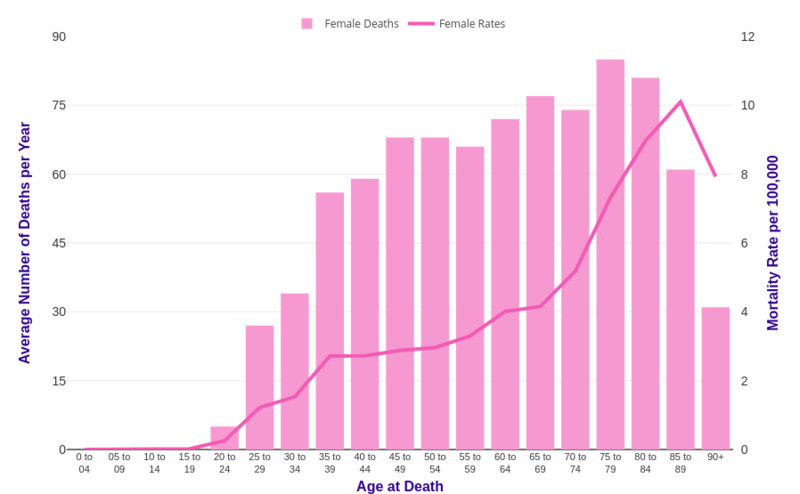 In the UK in 2014-2016, on average each year almost a third (30%) of deaths were in females aged 75 and over. 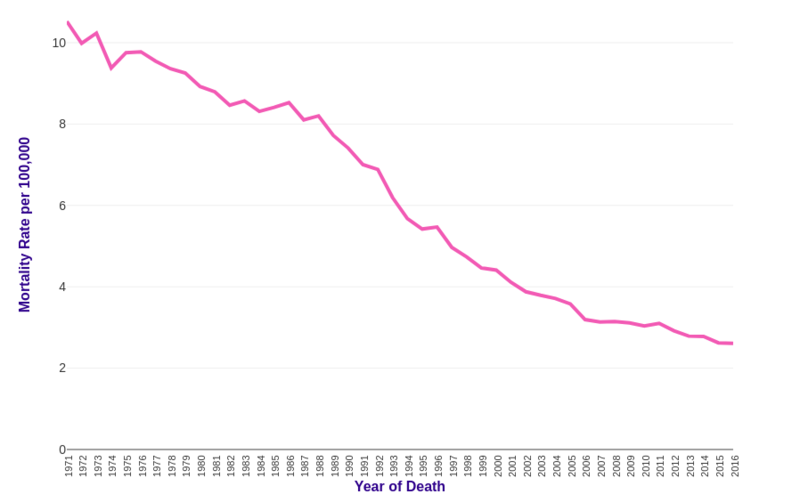 [1-3] This is a lower proportion of deaths in older age groups compared with most cancers. 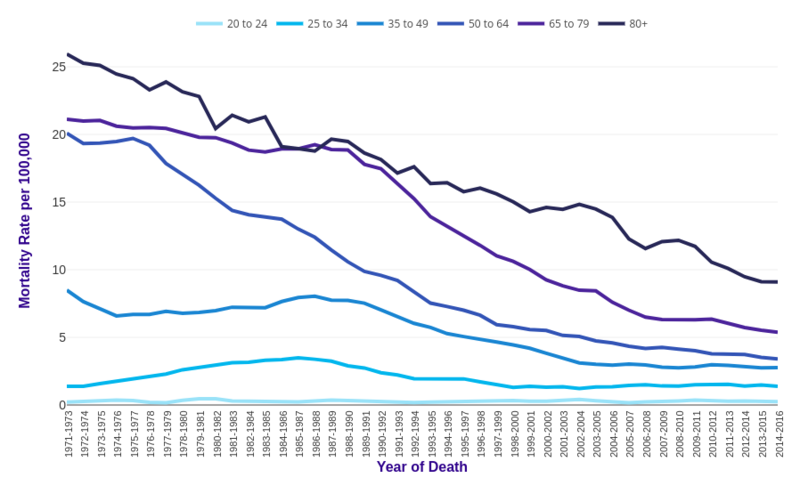 Age-specific mortality rates rise steadily from around age 15-19 and more steeply from around age 65-69. The highest rates are in the 85 to 89 age group. Data is for UK, 2014-2016, ICD-10 C53. 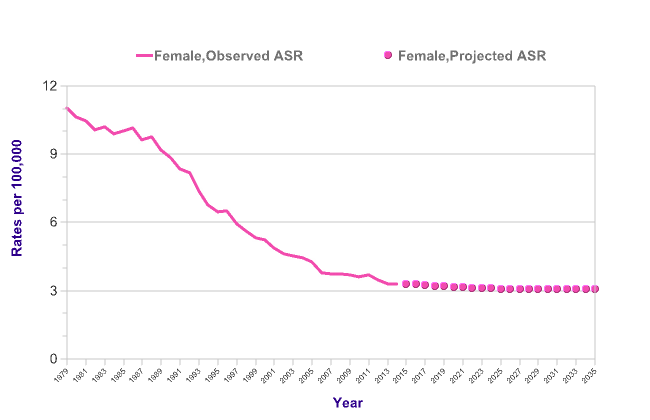 Cervical cancer mortality rates have decreased overall in some broad age groups in females in the UK since the early 1970s, but have remained stable in others. [1-3] Rates in 20-24s have remained stable, in 25-34s have remained stable, in 35-49s have decreased by 67%, in 50-64s have decreased by 83%, in 65-79s have decreased by 75% and in 80+s have decreased by 65%. Cervical cancer mortality rates are projected to fall by 7% in the UK between 2014 and 2035, to 3 deaths per 100,000 females by 2035. It is projected that 1,030 deaths from cervical cancer will occur in the UK in 2035. There is evidence for a strong association between cervical cancer mortality and deprivation in England. European age-standardised mortality rates are 148% higher for females living in the most deprived areas in England compared with the least deprived, as shown for cervical cancer deaths during 2007-2011. 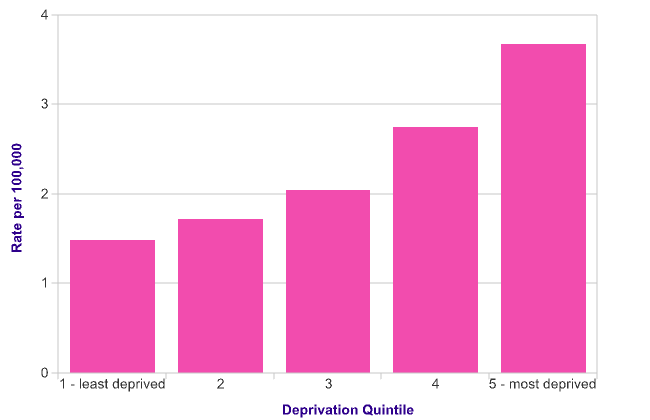 The estimated deprivation gradient in cervical cancer mortality between females living in the most and least deprived areas in England has not changed in the period 2002-2011. It is estimated that there would have been around 250 fewer cervical cancer deaths each year in England during 2007-2011 if all females experienced the same mortality rates as the least deprived.